Knowing this, how do you find THE great Gypsy group, a sort of Balkan equivalent of the Memphis Horns with the rhythm section from Muscle Shoals, these two being the gold standard of soul music, combining power and finesse, groove and virtuosity? It’s easy, just bring together the musicians from Clejani and of Zece Prajini! The story of Mahala Rai Banda begins at the end of the nineties with Aurel Ionita forming the group Rom Bengale in Bucharest. Their success had hardly begun – when this ensemble of young musicians was plagued and divided by addiction problems. Aurel then created the initial line-up of the Mahala Rai Banda – a name inspired by the Gypsy suburbs of the big Romanian cities – which released a CD on Crammed Discs in 2004. 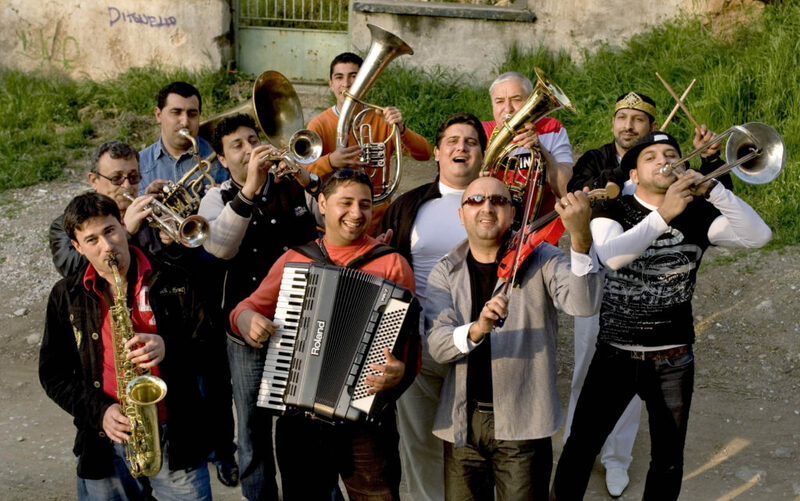 Now the band is back with its mix of Romanian musical traditions, oriental pop, rumba Catalan, reggae and manele, the Roma pop with ambigious commercial success. Keeping the spirit of an orchestra playing exclusively live, Mahala Rai Banda, with the tremendous “Ghetto Blasters” (Asphalt Tango Records, 2009) , has released a disc where the pure pleasure of playing and partying overflows. May your nights be long, very long indeed!